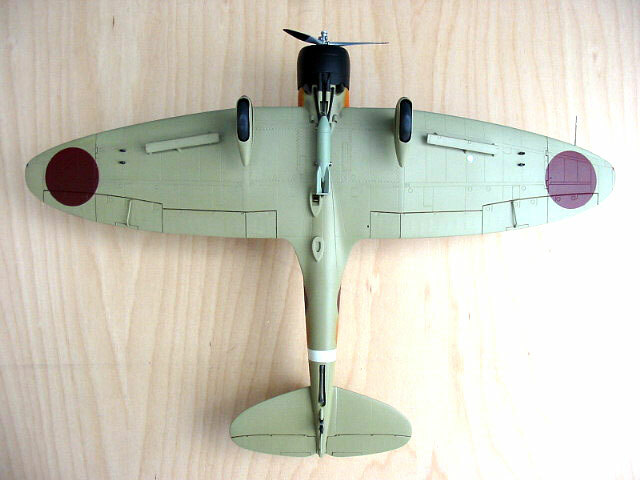 Aichi D3A1 Type 99, "Val"
The kit is the Hasegawa 1/48 Aichi D3A1 Type 99, Model 11, ''Val'. 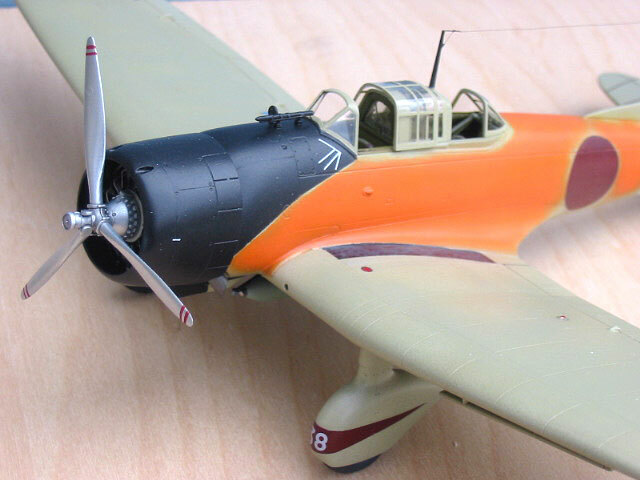 I chose to represent the aircraft flown by LCDR Kakuichi Takahashi and LT Seizo Kotzumi from the Japanese carrier Shokaku for the first wave Pearl Harbor attack. 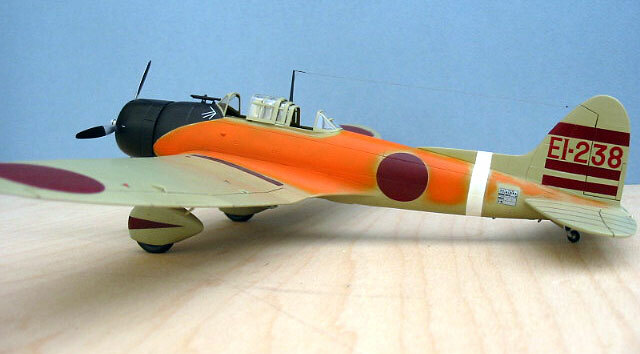 There has been a lot of discussion about this paint scheme, as well as some other colorful ones used that day by the Japanese. It is believed that some of the 'Vals' were painted up loudly for rallying purposes. Thanks to Pearl Harbor historian David Aiken, as well as countless others at J-Aircraft.com for the information, evidence, and debate concerning this topic. 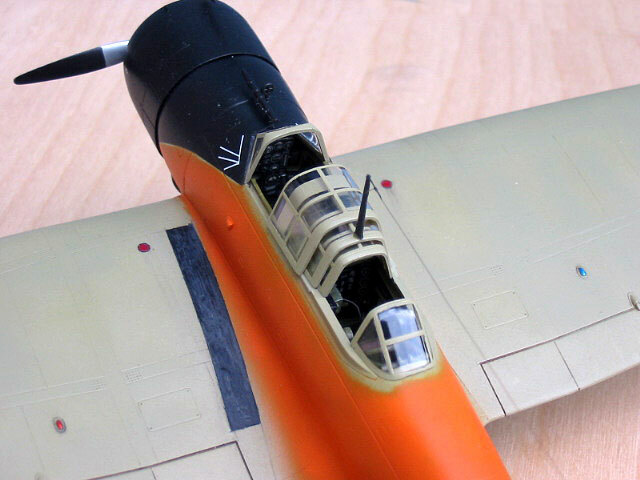 The kit was pretty much a straight build, with some additions such as seat belts, and wiring in the cockpit. I added wiring to the engine as well. 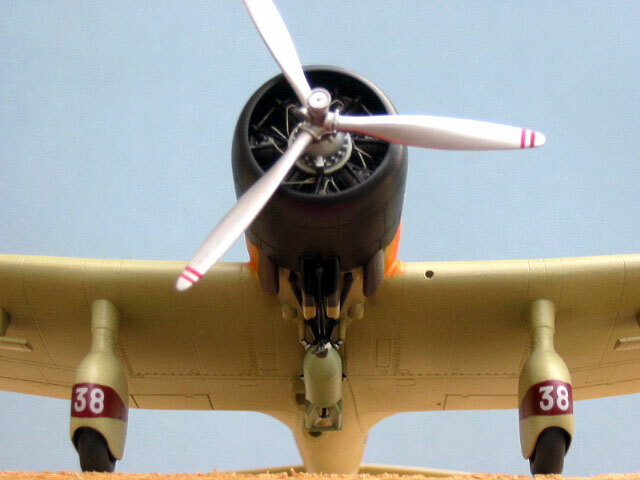 Since none of the Pearl Harbor 'Vals' used wing ordnance, I cut the racks to only keep the wing 'hard points'. A nose fuse was added to the 250kg land bomb at the centerline. Markings were painted except for data plate, and numbers/letters with Model Master enamals. The orange was a combination of orange and yellow to get that 'bright' look. It was applied after all other markings were, just as it had to have been on the boat prior to the attack. The base coat is a mix of SAC Bomber Tan and White, and anti-glare shield and cowling are a mix of Black and Blue (I couldn't give a mix ratio, I do it by what seems to look right). 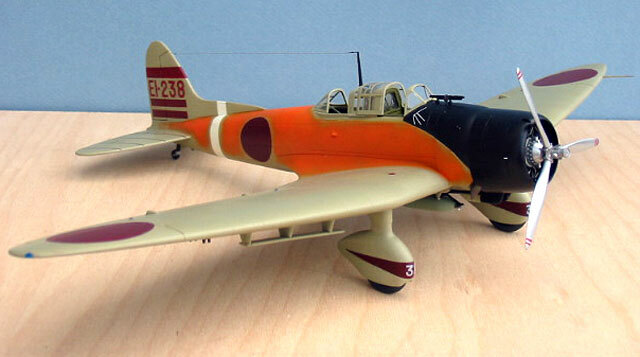 I finished the aircraft with a semi-gloss lacquer.